Random House Books for Young Readers, 9780399559129, 80pp. Explore how different artists have seen horses, and maybe even find a new way of looking at them yourself. Discover full-color photographic art reproductions of pieces by Picasso, George Stubbs, Rosa Bonheur, Alexander Calder, Jacob Lawrence, Deborah Butterfield, Franz Marc, Jackson Pollock, and many others—all of which feature a horse! Young readers will find themselves delightfully transported by the engaging equines as they learn about the creative process and how to see art in new ways. Taking inspiration from Dr. Seuss’s original sketches, acclaimed illustrator Andrew Joyner has created a look that is both subtly Seussian and wholly his own. His whimsical illustrations are combined throughout with “real-life” art. 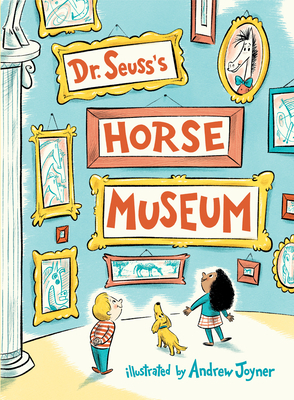 Cameo appearances by classic Dr. Seuss characters (among them the Cat in the Hat, the Grinch, and Horton the Elephant) make Dr. Seuss’s Horse Museum a playful picture book that is totally unique. Ideal for home or classroom use, it encourages critical thinking and makes a great gift for Seuss fans, artists, and horse lovers of all ages. Publisher’s Notes discuss the discovery of the manuscript and sketches, Dr. Seuss’s interest in understanding modern art, the process of creating the book, and information about each of the artists and art reproductions in the book. Author Bio: THEODOR SEUSS GEISEL—aka Dr. Seuss—is one of the most beloved children’s book authors of all time. From The Cat in the Hat to Oh, the Places You’ll Go!, his iconic characters, stories, and art style have been a lasting influence on generations of children and adults. Dr. Seuss’s long list of awards includes Caldecott Honors for McElligot’s Pool, If I Ran the Zoo, and Bartholomew and the Oobleck. To learn more about his life and books--and for fun games and activities--visit Seussville.com! Illustrator Bio: ANDREW JOYNER is the illustrator and author of numerous children’s books, including The Pink Hat, The Hair Book by Graham Tether, Duck and Hippo in the Rainstorm by Jonathan London, and The Terrible Plop by Ursula Dubosarsky. He also wrote and illustrated the Boris chapter book series about an adventure-seeking warthog. His books are now published in more than twenty-five countries. He lives with his wife on the Fleurieu Peninsula in South Australia. Visit him on the Web at andrewjoyner.com.au.